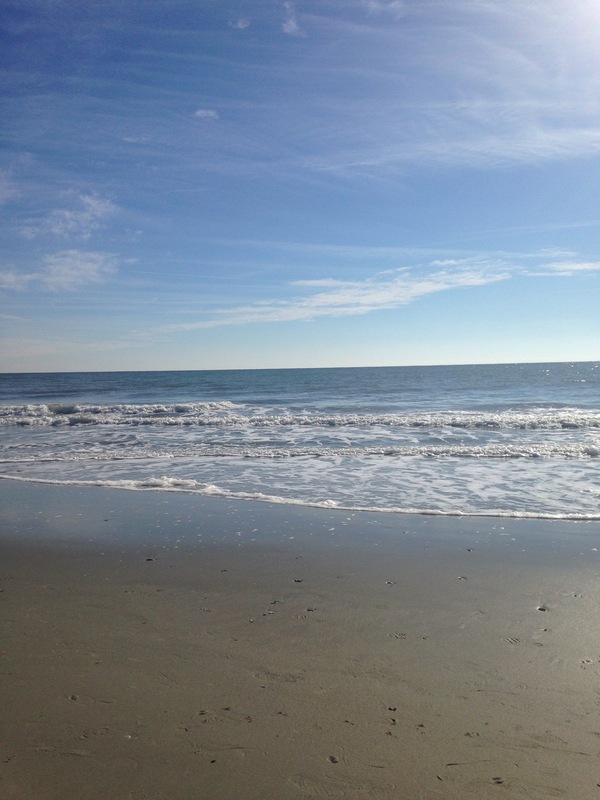 Re-discovering Myrtle Beach or That one Spring Break or Don't Be a Victim of Winter Weather! As I wade through the knee deep snow in search of my car, which I can't seem to find, my mind can't help but wander to warmer memories. One memory at the front of my stack of lovely moments, was the cool morning stroll I recently took in Myrtle Beach, South Carolina. A few weeks ago, we piled into our family van and took a ridiculously slow (thanks to our nursing six month old) road trip from Brooklyn, New York to Orlando, Florida where my in- laws live. Since we had the time, and since gas prices are so wondrously low, we decided to drive and help ourselves to side trips since there is so much to do and see off of I-95. In the past, we've visited Savannah and Charleston, Raleigh Durham and Atlanta, this time Mark made the case for Myrtle Beach. The first and last time I had been to Myrtle Beach it was 1999 and I was on Spring Break. As a nineteen year old, I even remember thinking - yuck! Myrtle Beach was crowded, it was dirty, it was full of seedy bars and shady people. That Spring Break was a disappointment I was ready to forget. The hubby however had other ideas. He had never been and wanted to go. Since Myrtle Beach made a reasonable second stopping point after our first break in Washington D.C., I gave in. I'm kind of glad I did. Myrtle Beach, during its off peak season, was nicer than I remembered. We found a beautiful hotel and were walking distance from some delicious seafood. I'm not going to lie, the boardwalk/main drag is still dodgy at best, but the beach, in the still of the morning, with a gentle 60 degree winter breeze is lovely. The sea grass rustled, the waves crashed, couples walked dogs, my three year old collected shells. The beach was a surprisingly meditative oasis. To be fair, the snow on Sunday as it was falling, and even on Monday as it lay shimmering and still, was also quite meditative and oasis- like. Today, as I dig my car out with a dustpan so I can take my little one to preschool, I see little more than a cold and inconvenient mess. At least I can mentally escape to that morning stroll along Myrtle Beach. Mother nature, you can freeze my fingers and toes, you can make me slip and slide, but you can't take my memories!